While searching for San Francisco in 1865, the American clipper, Sir John Franklin, lost her way in a dense fog and mountainous sea. When the weather cleared some 24 hours later, the captain viewed the breakers ahead with great alarm….but it was already too late. 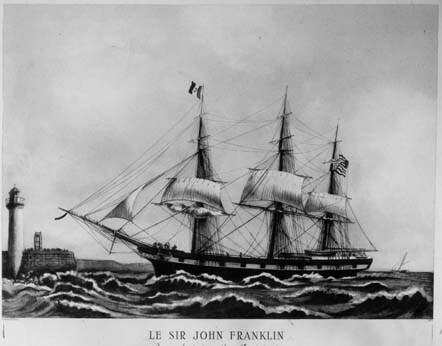 The Sir John Franklin screeched loudly as she struck the dark reefs. A crew member shouted “Abandon ship!” when he discovered the huge hole in the hull. The cargo, including pianos and dry goods and liquor, followed them, swept away by the powerful current. The captain, first mate and 11 others struggled to swim in the heavy surf but the die was cast as all met a watery death on that fateful day. Witnesses, local residents who witnessed the horrific shipwreck, called it the most disastrous to date. In memory of those who lost their lives in the insurmountable seas, the place where the Sir John Franklin struck (midway between Ano Nuevo and Pigeon Point) was christened Franklin Point. Photo: San Mateo County History Museum. Please visit the museum at the historic Redwood City Courthouse. The History Museum is my favorite charity. This entry was posted in Franklin Point, Pigeon Point Lighthouse, Sir John Franklin. Bookmark the permalink.